A group of Ada High School senior boys gather to pray for their school. An estimated 3 million elementary through college Christian students gathered at flagpoles on campuses across the United States and many foreign countries Sept. 24 to pray for moral and spiritual awakening for their schools and communities. This year, See You at the Pole (SYATP) marked its 24th year. 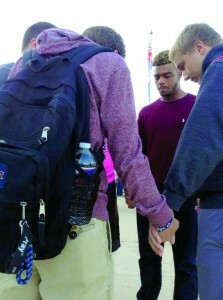 Many locations across Oklahoma hosted rallies the evening of SYATP. There were more than 20 associational rallies in Oklahoma this year. Bryan Association met at Southeastern Oklahoma State University in Durant, and had more than 2,100 in attendance. At presstime, a reported 4,200 students attended a rally with more than 240 decisions. Early estimates project as many as 10,000 attended a rally with hundreds more decisions. Baptist General Convention of Oklahoma (BGCO) Student Evangelism & Missions Specialist Nick Atyia coordinated the event. 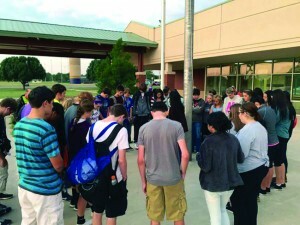 “The SYATP event, to me, is a call to the spiritual discipline of prayer” Atyia said. “It challenges us all to spend time laying our schools, friends, government, and communities at the throne of Jesus. We petition for God to do work in a powerful way. A group of students met at the Chickasha High School flagpole. Todd Sanders, BGCO student education specialist, spoke in Newcastle at the Newcastle/Blanchard area rally. Sanders hopes that the rallies helped students walk away knowing that a continual life in Christ, and not just the event, is what is desired. “I hope they walked away challenged on how they might, from this point forward, live lives that glorify God,” Sanders said. 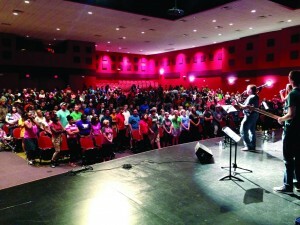 Students gathered to worship at a rally at Cache High School. Atyia also reflected on how to encourage students who were brave enough to stand alone at their flagpole. 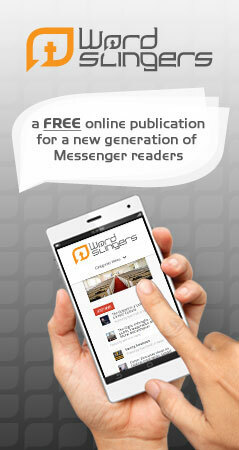 “The apostle Paul understood standing alone,” Atyia said. “In 2 Tim. 4:16-17 he says this, At my first defense, no one stood by me, but everyone deserted me. May it not be counted against them. But the Lord stood with me and strengthened me, so that the proclamation might be fully made through me and all the Gentiles to hear. SYATP global prayer meetings were held on campuses preferably at 7 a.m. local time. Last year, event organizers added Global Week of Student Prayer to the event, set this year Sept. 21-27, to accommodate schools closed or engaged in other events on the 24th. Never Stop Praying was this year’s theme, based on Eph. 6:18. Students also prayed for individual friends, students and family members, indicated by posts to the event’s Facebook page and on Twitter, at #NeverStopPraying and #SYATP. Those posts indicate participation in all 50 states, Guatemala, Turkey, Canada, Australia and Berlin, Germany. Many students have committed to pray every day of the week. 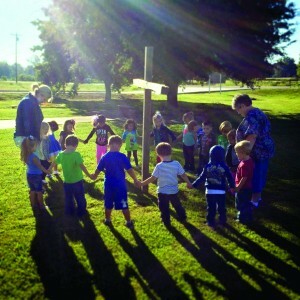 Idabel, Trinity Preschool circled around a wooden cross to pray. The annual SYATP event grew out of a 1990 DiscipleNow weekend, when a small group of students prayed at flagpoles at different schools on a Saturday night. Inspired by the small event, youth leaders across Texas organized SYATP in 1990 and drew 45,000 students to prayer meetings in four states. By the next year, an estimated 1 million students gathered in prayer at flagpoles across the nation, according to the SYATP website. To learn more about the history of SYATP visit http://syatp.com/.